A few months ago we got rid of our guest bedroom set because it was finally falling apart, so I’ve been needing to build a new queen size bed frame. I want the bed frame to have built in storage (drawers) so that a separate dresser isn’t required, however the room layout requires the bed to be pushed up against one wall so I can only add drawers to one side. 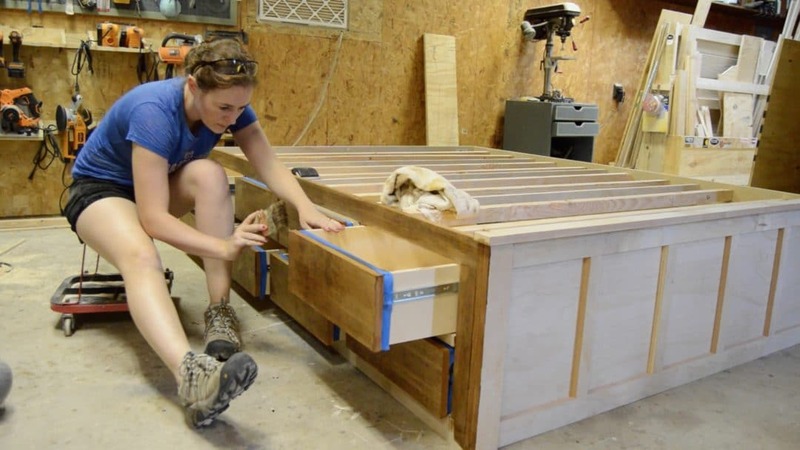 Keep in mind, that you can follow my plans to build this bed and just alter them slightly to have drawers on both sides. The first thing I did was use my track saw to break down the different sheets of plywood. I first cut the sides, back, and center walls. I drilled pocket holes in the side pieces and used them to attach the sides to the back. Alternative: if you don’t have a track saw then use a circular saw with a temporary fence. I grabbed the center walls and used more pocket holes to attach them to the back. I would first screw in the top screw then use a speed square to make sure the wall was square to the back before attaching the rest. I also set the square on the floor to make sure it was square to the floor. Next I started making the face frame for the side of the frame with drawers. I first cut the top and bottom rails then cut the stiles. It’s important for the stiles to be the same height so I would first cut them to width at the table saw then set up a stop block at the miter saw to cut them to length. I drilled pocket holes in the ends of all the stiles then started attaching them. I would measure and mark the location of the stiles then glue and screw it down. I repeated with the center rails, first measuring up then gluing and screwing them in place. Note: Use a tape measure to make sure the left and right are the same distance. Once these are in place, I came back with the top rail and used the pocket holes to attach it. Note: I used a speed square to help me keep it plumb while I screwed it down. With the face frame complete, now I set it in place and attached it to the body with the pocket holes I drilled earlier in the sides and center walls. It’s important to make sure the back and front of these center walls is attached in the same location so I would first measure the back location then move the front to that same dimension. I would also use a square when screwing them down. Next I started adding the sliders. To make this step easier I first measured where I wanted the slider to sit on the walls then cut a scrap piece of wood to that length. This way I could just set the scrap against the wall then set the slider on top of it and screw it down After the top sliders were attached, I cut the scrap down and repeated the steps for the bottom sliders. For the drawers I used my table saw to first cut the four different pieces for all eight drawers. The front and back, and also the two sides. 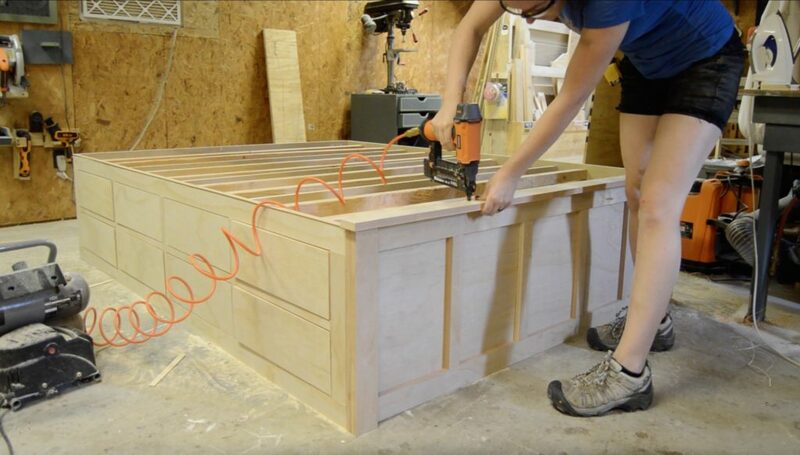 I’m making the drawers so that the sides and front have a dado cut into them, near the bottom, for the bottom of the drawer to slide into. I could just swap out my regular blade for my dado stack, however I didn’t want to go through the hassle so I made multiple passes to make the dado. I would set my table saw fence and run every side and front piece through once. Then I would move the fence over 1/8” and run them through again. I repeated this a third time to make the dado a 1/4”. At this point I grabbed the backs and ran them through once so that they are now the exact height of the dados on the other pieces. This will allow the bottom to slide in place. While I was cutting I went ahead and grabbed my 1/4″ plywood and cut all the bottoms. I took all the front and back pieces and drilled a few pocket holes in each end then started attaching the drawers. Note: The front and back are inside the sides of the drawer. 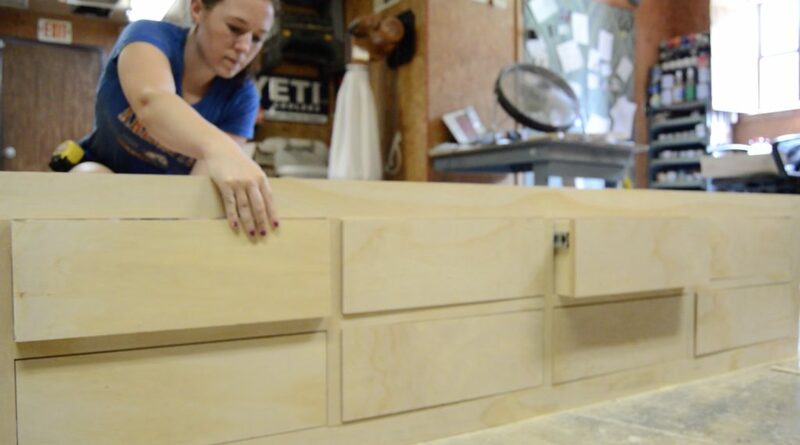 Once the four pieces are attach, slide a bottom into place and repeat until all the drawers are made. Before attaching the drawers to the body I grabbed a scrap piece of wood to use as a spacer. I would set this piece on the lip of the drawer slot then set the back of the drawer on top of it. To make this step easier I also cut a separate scrap to use as a spacer for the front of the drawer. This way the drawer is nice and level while I add the slider to the sides. I would pull the slider out until the front was even with the front of the drawer then go through and attach it with screws. Repeat with all the drawers until they are all attached. At this point I measured each one of the drawer openings to make sure they were all the same. Note: If you’ve made everything square up to this point then they should be. Then I used my table saw to cut the door faces to size. I would first cut them to exactly the dimensions then once I verified that they fit, I would take them back to the table saw and cut off an additional 1/8” on each side (or a 1/4” off two sides). Next I plugged in my hot glue gun and put a dab on either side of the front of the drawer, then quickly placed the faux face in place. I would set it in place then move it around until all the reveals were about equal. You’ll have to move quickly since hot glue dries fast. Once I had them all temporarily glued on, I moved to the inside of the drawer and used two screws to attach it permanently. To make the slats, I used 2x4s but I decided to rip them in half first. I drilled two pocket holes on each end then started attaching them. I started off using a scrap temporarily nailed to the side to make attaching them easier, but ditch the scrap because these fit tightly enough to hold themselves up. I made sure they were level with the center walls then screwed them down. With one side attached, I repeated for the other side. For this side though, I grabbed a small scarp to act as a spacer. I would set the spacer on top of the drawer then just make sure the slat was resting on it flush before screwing it down. Since I don’t have drawers on both sides of my bed, I could have added drawers in the footer to utilize more space. However, Cody and I both like the look of a regular footer without drawers, but keep the alternative in mind that you can very well add more drawers here. I used my table saw to cut a top and bottom rail, plus a few stiles. I glued and nailed these in place. I also cut a top cap to place on top, I glued and nailed this piece as well. Before getting to the finish I first used some painters tape and went to every drawer and taped off the body, so that I can stain the edges of the face without getting any on the body. I’m using the stain Early American for this project. Last thing I did was cut a piece of plywood to lay on top of the slats. I’m using a mattress that Leesa.com gave to me to try out. Leesa is a mattress company that sells a mattress that’s comparable to a Tempurpedic but for half the price. If you want $75 off a mattress that is crazy comfortable and ships to your door then go to Leesa.com/april. Mattresses like this require a solid bottom, if you do not have a Tempurpedic style mattress then you can don’t have to have a solid platform. After everything was dry I moved it into the house, or actually had my husband and a friend move it into the house and I grabbed the door. : ) I attached some handles (the store only had 7 in stock so it’s missing one temporarily) then called it done. Wanna build your own? I have put together a set of plans for this project. It is 15 pages that includes a material list, a cut list, and all the dimensions I used. I walk you through step by step, with a 3D model, on how to build this project.